Whether it is the angular drawings of Ebtisam Abdulaziz’s graphic sentences or the fragmented patterns of Katie Venner-Woodbridge’s architectural drawings, many of the artworks in The Diving Bell & The Butterfly, an exhibition that I curated at Showcase Gallery in Dubai, offer new ways of seeing and visual narratives of otherwise unspoken forms. Abdulaziz, an Emirati who lives and works in Washington DC has a background in science and graduated with a double degree in mathematics and science from Al Ain University in 1999. Her practice has centred around making codes and language from words and numbers and it is what makes her work so distinctive and successful. For this 2010 series titled Words Into Art, she has taken sentences from her diary and transformed them into coloured graphic drawings. Venner-Woodbridge is showing works from her 100 Days series, where she made a drawing a day for 100 days. The compelling and enticing patterns first emerged from study patterns she had made of buildings around her, which she fractured and broke to create new forms and annotated with watercolours to give them depth and surface. Katie Venner-Woodbridge. 20 drawings (ink and watercolour) from the 100 Days series. Courtesy of the artist. The artists in the exhibition were brought together because they all work with some kind of self-imposed restriction. The title of the show comes from a novel by a French journalist, Jean-Dominique Bauby who was paralysed by a stroke and suffered locked-in syndrome; something he metaphorically refers to as the diving bell. The butterfly is his creative spirit and freedom that he still manages to cling onto. While I was in the process of curating this exhibition, I was fascinated with this as a context under which to unite artists whose practices I admire. It is difficult to put restraints on creative freedom, but when you do, the results can be even more fabulous than a loose and unfettered approach. There are three calligraphers in the exhibition who all choose to acknowledge the strict rules and proportional dimensions of traditional calligraphy but are also interested in subverting those rules. Wissam Shawkat studied the art of calligraphy for several years in his home country of Iraq and now he builds his contemporary practice on maintaining the proportions of the script but creating new and exciting ways of viewing the letters. Sasan Nasernia uses letter forms as his building blocks but he is not concerned with meaning of the written word, instead he couches his practice in a fascination with writing as a coded system. His piece – The Other Side – takes the viewer into another dimension, as he imagines an artistic approach to calligraphy is able to do. Amal Al Gurg is the final calligrapher on display. Her work deconstructs Arabic letters to become illustrative tools. The largest piece, Amalgamate uses two specific letters (thal and alef) to represent the male and female. The letters do not touch, so the work acknowledges societal restrictions of gender segregation yet the finished piece also celebrates unity. Aspects of infinity, faith and humanity are also brought into the exhibition through the work of Afshan Daneshvar and Ahmed Al Faresi. Daneshvar’s work is from her Boats series and features a grid pattern of origami paper boats. Though seemingly identical, each individual boat has been hand-made and is therefore unique. Amassed together and in this case, unfolded from their original form, the boats represent humanity floating in the sea of life. Al Faresi’s work is visually very different but his repeated use of the infinity symbol also points to subjects larger than himself. He is interested in science, technology and information coding as well as the infinite power of the divine. The random patterns of his work are balanced by the deep concept behind them. Julia Ibbini. Study No.1 for the Sublime Line. Cut paper layers over metallic ink on Mylar. Courtesy of the artist. Julia Ibbini’s practice is complementary to Al Faresi’s in the way that they both rely on structure and pattern, but Ibbini is precise and meticulous where Al Faresi is more free flowing. Ibbini’s work is made of many layers of laser cut archival paper and mylar, which are then emphasised with bold inks and paint. Almost enchanting to look at, the pieces offer the viewer a meditative experience to get lost in colour and detail but that is underlined by the fact that the patterns are so regimented. Another artist whose attention to detail is mesmerising is Mariam Abbas, whose speciality is miniature drawing. Her mosque series shows staggering renderings of some of Dubai’s places of worship and she has also used the pointillism technique to shed light on old Arabic urban spaces. Mariam Abbas. 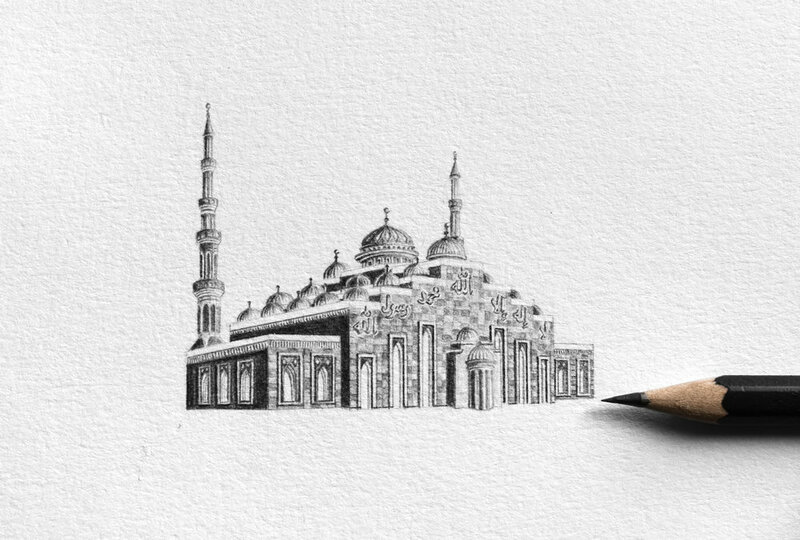 Miniature Masjid - D. Graphite on paper. Courtesy of the artist. Jessica Watson-Thorpe monoprints and layered canvas pieces stem from an exploration into the numerical and geometric mysteries of the Islamic faith. Whilst also taking the mosque as a starting point, she is interested in diverging from the rigidity of the form and peppering her pieces with almost hidden and secret details that reference the numbers of units of prayer, the sequential nature of certain elements of Islamic practice and they also play with light. The canvas pieces are made from several layers of ink and tissue and the ruptures and tears in the final product are as important as the precision that she used initially to make the monoprints. Finally, Nathaniel Alapide’s process is one of ritual. He uses magazines as his canvas and treats them by burning, cutting, ripping and drilling screws into them until he is satisfied with the result. His work contains a grid of the butterflies, which represent the fragility of life. Alapide is also interested in the laws of opposites that surround us such as order and chaos; day and night and black and white – hence the monochromatic nature of his work. The Diving Bell & The Butterfly. May 9 - June 30, 2018. Showcase Gallery, Alserkal Avenue, Dubai.